SPAR has been providing shipyard production planning and management control software since 1972. 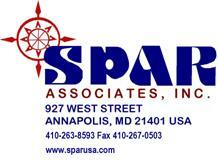 In addition to its software products, SPAR offers a variety of support services, including custom software design and development; training and software maintenance services; independent cost estimating; supplemental shipyard planning and scheduling services; and management consulting to various interests in the marine industries. We are always available to address whatever questions that you might have. Your success is ours. Publications are available in PDF file via electronic mail. Please add my name to your mailing list.